I know what you are thinking, wait…I thought tipsfromthedisneydiva.com was a Disney fan-based website. This doesn’t look very “Disney-ish.” You are correct, we ARE a Disney fan-based website, we do love all things Disney, and yes, this book is not Disney-ish at all. So why are we doing a review and giveaway for “Ribbons”? Yesterday, I had an interview publish with Suzanne and R.J. Ogren, if you missed it, you can check it out here. 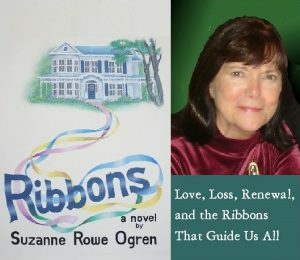 In this interview, you will meet the author of Ribbons, Suzanne Ogren. She actually has a very strong Walt Disney World background, as she worked at Walt Disney World in the 1970’s. This is why we are reviewing and hosting a giveaway for her novel, “Ribbons”. Allow me to preface this review with a disclaimer, this book has absolutely nothing to do with Disney. Another disclaimer, this book is intended for an adult audience, as it does have a minimal of very mild language and extremely mild adult situations. With the disclaimers addressed, I will be happy to give you my review of the novel, “Ribbons”. The setting takes place in modern times, and the heroine, Samantha Garrett, is a professional actress and blossoming author. Samantha has already had a traumatic life, losing her husband at a young age, as well as her father. As the story begins, Samantha has suffered another loss, her aunt, prompting her to move to her mother’s bed and breakfast to help her mother run the business. Soon after moving to a small town in Virginia to help her mother, Samantha discovers unexpected romance, allowing her to finally move on with her life after the death of her husband. After this whirlwind romance, resulting in what could be the happily ever after she has sought for a while, another tragedy strikes. Personally, I love a good mystery novel. I’m a crime show enthusiast, and have always loved the element of mystery. It is as this point in the storyline that a small mystery does indeed emerge. I can’t go into too many details about this aspect, but I can say that it provides that unexpected plot twist that most of us love. In an attempt to recover from Samantha’s most recent tragedy, her best friend convinces her to take an unexpected trip to England, where she will stay with a family friend who has also recently become a widower. Together, they form a bond through the tragedies they have both experienced. At the same time, Samantha has good news about the novel she has been working on. Samantha likens her relationships and experiences in life to ribbons, intertwining and weaving through each other, guiding her life and her future. Honestly, I found this book to be extremely well written. The characters really draw you in, connecting you with their lives. There are highs and lows intertwined throughout the novel, much as there are highs and lows throughout life. I enjoyed reading “Ribbons” (even if it wasn’t a Disney-ish book) and do recommend it. If you would like to order a copy for yourself, you can find “Ribbons” here. If you would like to read “Together in the Dream” by Suzanne and her husband, R.J., written about their time working for Walt Disney World in the 1970’s, you can order it here. Suzanne’s husband, R.J. Ogren, who is an author as well as accomplished artist, has a book as well, “The Design of Fear” which you can order here. If you’re interested in reading “Ribbons”, you will be happy to know that Suzanne Ogren has generously offered to give one lucky winner a copy of “Ribbons”! Just click on the Rafflecopter entry form below for your chance to win! Best of luck! 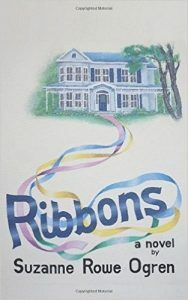 ****Disclaimer: Though Suzanne Ogren has thoughtfully provided us with a copy of her novel, Ribbons, to give away to a lucky reader, I did purchase my own copy for the review. All thoughts expressed about this novel in my review are my own. The images used in this book review belong to Suzanne Ogren. 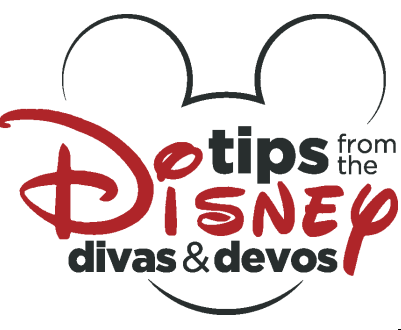 We at Tips from the Disney Divas and Devos hope you enjoy reading our articles, and encourage you to share any you feel may be of interest to someone else. We do ask, however, if you choose to share the photographs attached to our articles, you give credit to the photographer. Thank you for your cooperation and sharing our love of Disney! All entries will be verified by Tips from the Disney Divas and Devos. You must LIKE each Facebook page for your entry to count. I look forward to your daily posts. I am a Disney addict and go there as much as I can. I have raised my two children to be Disney kids. We are passholders and live about 1 1/2 hours aways, so you know when ever we can we are visiting the mouse and his kingdoms.